Double Magic MegaSpin Slot Review - Casino Answers! 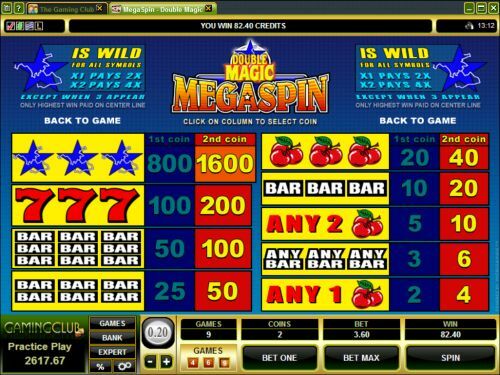 Double Magic MegaSpin is a 3-reel, 1-line megaspin slot machine developed by Microgaming, featuring a wild symbol and multipliers. You can play the Double Magic MegaSpin slot machine at Bovada. Coin sizes on the Double Magic MegaSpin slot machine are $0.10, $0.20, $0.25, $0.50, $1, $2 and $5. You can play 4, 6 or 9 slot machines at a time at up to 2 coins per slot. You can bet anywhere from $0.40 per spin on the Double Magic MegaSpin online slot game up to the maximum total bet of $90 per spin. The Double Magic MegaSpin slot game has a very good betting range that is ideal for most online slots players. 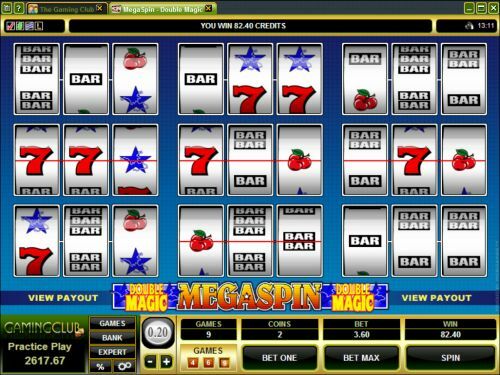 To play Double Magic MegaSpin Slots, select your bet and press the “Spin” button. To play the 2-coin maximum bet on all of the slots selected, press the “Bet Max” button. The top-paying symbol on the Double Magic MegaSpin slot machine is the Star. If you land 3 Star symbols on one of the slots in Double Magic MegaSpin, you will win the 1600 coin top jackpot. The Star symbol is a wild multiplier symbol. Not only does it substitute for all other symbols in Double Magic, but it will multiply your winnings by 2X (for one) or 4X (for two symbols). To win these payouts, sign up and play now at Bovada! The Double Magic MegaSpin casino game has an autoplay mode with advanced settings. To access the Double Magic autoplay feature, hit “Expert” and you can play 5 or 10 autoplay spins or hit the “Auto Play” button to open up advanced settings. You can set the number of spins (5, 10, 25, 50, 100, 250 and 500), number of seconds between spins (0, 0.25, 0.50, 0.80 and 1.50), stop once all spins are complete, stop when jackpot is won, stop if a win exceeds or equals ($25, $50, $100, $250, $500, $1000 and $2500), stop on any win and stop if credits increase/decrease by ($25, $50, $100, $250, $500, $1000 and $2500). You can stop autoplay at any time on the Double Magic MegaSpin slot machine. If a single 3-reel, 1-line classic slot machine is not enough action for you, you can really get things going by playing the Double Magic classic slot MegaSpin-style! You can play the exciting Double Magic MegaSpin online slot at Bovada. Can players from the USA play the Double Magic MegaSpin slot game? Players from the United States cannot play the Double Magic MegaSpin fruit machine for real money at this time. For a great selection of unique USA-friendly slots you can play, please visit Slotland Casino. Where can I read more megaspin slot game reviews? If you can’t get enough megaspin action, feel free to read our High 5 MegaSpin Slot Review.